On December 10-14, the Arctic Partnership Week 2018 will be held in Busan, Korea. The Arctic Partnership Week has been organized annually since 2016. During its existence, the event has focused on Arctic policy, science, technology, shipping, energy and resources. The AEC will be represented during the 7th Arctic Policy Forum taking place on the second day of this year’s Arctic Partnership week. The Chair of the AEC, Mr. Tero Vauraste, will deliver a keynote speech on the plenary session of the topic “Arctic and Innovation”. 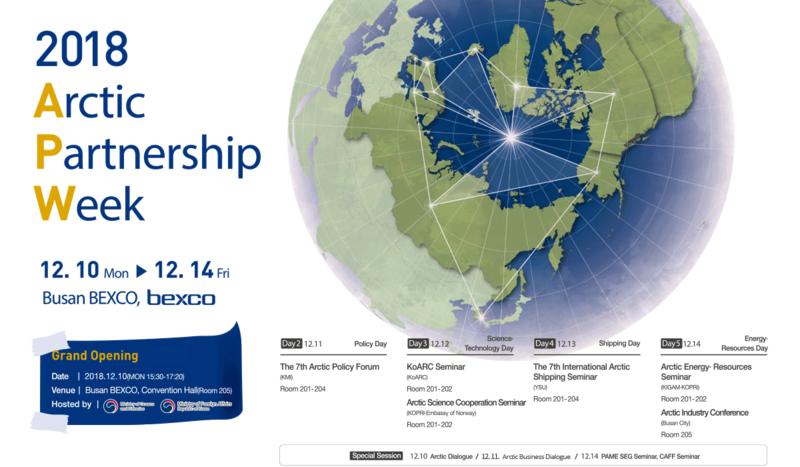 Arctic Partnership Week is followed by several special sessions during the week. One of these special sessions include the Arctic Business Dialogue, co-organized by the Embassy of Denmark to Korea and the AEC. This event will gather an invited group of business representatives to discuss challenges and opportunities related to Arctic business.